Water reducer: Reducing the amount of water in a batch of concrete increases strength and durability, while maintaining the correct slump and workability. Air Entrainer: To improve freeze/thaw durability, this admixture creates microscopic air bubbles in the concrete. Retardant: This delays the setting of the concrete, which can improve workability during placement on hot days or after long transport distances. High Early: By accelerating mid-stage hydration, High Early modified concrete significantly increases the early strength gain of the concrete, achieving 7-day strengths that are equal to standard 28-day strengths with no loss in final strength. This can create tremendous cost savings in fast-moving construction projects. Superplasticizer: Often added at a job site to increase workability for placement, this admixture will increase the slump and workability of concrete in the plastic state without the addition of water, which means that the final strength and durability of the concrete will not be affected. Integral hardener: Increasing the hardness of the entire concrete mass, hardener improves abrasion resistance as well as durability. This is particularly suited to high-traffic floors, decks, and slabs. Colourant: Available in a wide variety of hues, colourants can be added to tint the concrete, enhancing architectural designs. Integral waterproofer: This admixture acts to reduce the water permeability of the hardened concrete, even in air-entrained mixes. These products are available for pick-up or for delivery in larger volumes. Contact us to discuss your aggregate needs. We have a broad selection of precast concrete products in our inventory, including lock blocks, traffic barriers, and many more. Precast products are also available made-to-order. Call us today to discuss your needs. Don’t let the season stop your project. We are capable of producing concrete in temperatures down to -20°C. Contact us to your project’s specific requirements. We offer snow plowing and removal services through the winter. Call us today for help with your drive or parking lot. Interoute Construction has access to complete and accredited concrete and aggregate testing labs at our facilities in Golden BC and Edmonton AB. The focus of this lab is on our own internal testing for process and Quality Control, but we are happy to help with your testing needs. Call us today. 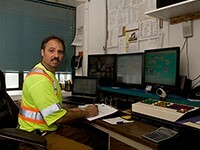 Orlando Dias has been with H&J Ready Mix since 2007. As our Concrete Supervisor, he can help you plan your next concrete project. Serving the Columbia-Shuswap for over 20 years, we're a proud member of the Revelstoke community. We want to go beyond regulations, and aim for a greener future. We know that every project comes with a different set of challenges and requirements, and so we’ve developed custom mix designs for specific applications. Whether you’re filling an open excavation, constructing a wall, or aiming for LEED certification, we have a product that will meet your needs.